General Motors' luxury and performance auto marque Cadillac has partnered with Cool Hunting, a 12-year-old digital publication on design, technology, style, travel, art and culture. The automaker, based in New York, will be inaugural sponsor of the first of what will be a yearly design contest called Cool Hunting 25 (CH25). The program recognizes up-and-coming talent from around the world whose work “represents ideas that are designing the future and driving innovation across multiple creative disciplines forward,” per a statement from the publisher. The publication, along with digital studio and network Largetail, started an open call for nominations for the CH25 program this week within a dedicated, Cadillac-branded section of the Cool Huntingsite. The nomination period ends on May 31, at which time a panel of designers and futurists and the publication’s editorial team, will review entries and select 25 across disciplines including Food and Drink, Design, Technology, Style and Culture. One of the panelists happens to be Andrew Smith, executive director of Global Cadillac Design. Cool Hunting first partnered with Cadillac to sponsor the launch of the publication's iPad app, which was in the iTunes store when the first iteration of the Apple tablet launched. “We have had programs with them since,” said Rubin, who notes that Cadillac has been focusing on wrapping its “Dare Greatly” campaign platform around up-and-coming designers, artists, and technologists. 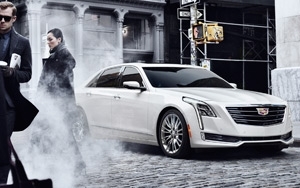 “We have known [Andrew Smith] for a little while now because on the editorial side of Cool Hunting we have written a lot about Cadillac,” says Rubin. “Some designers are more accessible than others and he's one of them. He's a very down-to-earth guy, very smart and talented.” He adds that the publisher has worked with other automakers over the years, including Lexus, Lincoln and Land Rover. CH25 honorees will be announced in July, with each member’s story presented by the Cool Hunting editorial team through the medium in which each winner works (video, words-and-pictures, audio interviews, and photo essays, for example) on the program’s dedicated page as well as shared across social channels. The winners also get to network and work long-term with the panelist closest to their milieu. New York-based Largetail worked with The Story Lab, and Cadillac’s agency Publicis North America and media shop Carat to put the contest together.